This will be the best summer job of your life. Put on a VYCC green uniform and help us change the world. On a Farm or Conservation Crew, you will do this and so much more. Apply Today! Apps are due May 15, 2019. 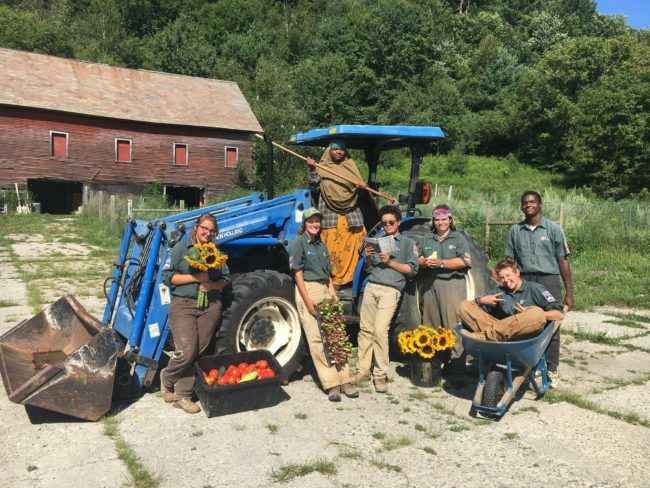 We are looking for Vermont youth, ages 15-18, to work: on our farm crews in Richmond or Newport; our Conservation camping (Spike) Crews in Dorset, Lamoille and Washington Counties, and around the state; or on our daytime Community Crews in Burlington, South Burlington, Williston, and Woodstock. Get paid to work outside for 4 or 8 weeks between June and August. This summer job could change your life. 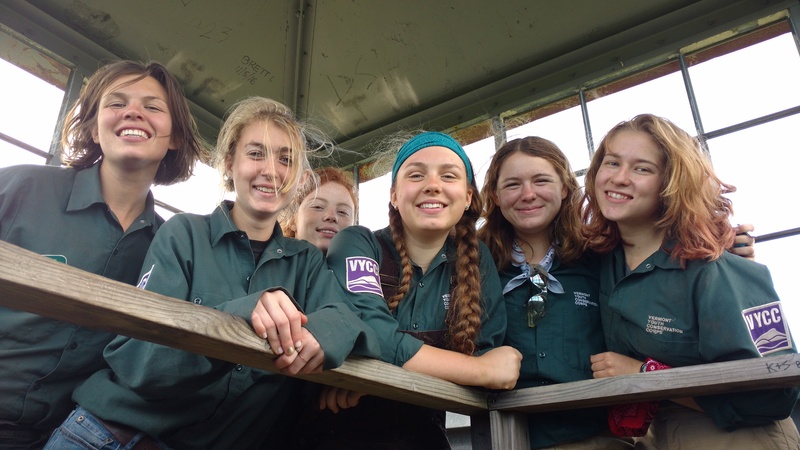 VYCC offers paid outdoor experiences, possibilities for future jobs and learning opportunities, introduce you to new lifelong friends, and get you outside on a farm, in VT’s state parks, forests or in your own community. As a Youth Crew Member, you’ll work on a small crew made of 6-8 other Crew Members around the same age and two Crew Leaders. You’ll work together growing organic food for Vermonter’s in need; improve our state parks and town greens; help keep our lakes and rivers clean; and make the outdoors more accessible for all of us! VYCC has Youth Crews in our Conservation and Farm programs. Depending on your interest and availability we will help you find the right crew for you! No experience is needed! We hire youth who want to leave their mark and be part of a hard working crew. Between orientation, guidance from your Crew Leaders and fellow Crew Members, VYCC will teach you all you need to know to succeed on a crew. Curious to learn more? Want to join a crew? Fill out our application, have an interview with one of our staff members, and get ready to learn and grow! VYCC has two main types of crews: Community Crews and Spike (camping) Crews. Community Crews are part of our Farm or Conservation Programs where the crews work during the day and head home at night. Conservation Spike Crews work during the day and camp near the crew’s worksite. What is a Community Crew? These crews come together as a team to enhance local natural areas in your own community or plant and harvest vegetables by day and return home at night (no camping needed!). Projects and tasks on a Conservation Community Crew might include building trails and bridges in local parks, building rain gardens in town, and removing invasive species. Our Farm Community Crews may be planting vegetables, harvest food for our Health Care Share (providing food for food-insecure families), taking care of the chickens or pigs, and learning how to prepare delicious food. Community Crews: Monday – Friday, 7:45 a.m.-4:30 p.m. Note: the Farm does not work on Fridays. 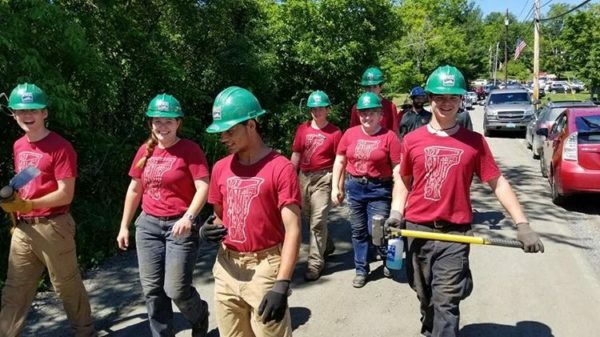 Spike crews are modeled after the Civilian Conservation Corps, a government-funded program for young adults before World War 2 that provided hands-on training through conservation work on public lands. A “spike camp” is a secondary or temporary camp established by a forestry crew that was accessible from the main camp. These spike camps would make travel to work sites easier. All our Spike Crew Members live in tents in a camp setting and work on high-priority conservation projects around the state of Vermont. Crews live together for the entire session and decide as a group how to spend their weekends. Crews are co-ed and consist of up to eight Crew Members and two Crew Leaders who come together from all walks of life to build strong bonds with each other and the surrounding environment. They complete high-priority conservation projects such as trail building, bridge construction, watershed restoration, and historic building preservation. Crews work with a variety of sponsoring agencies including the U.S. Forest Service, The U.S. Army Corps of Engineers, Vermont Department of Forest, Parks, and Recreation, and various local and national non-government conservation organizations. These relationships expose crews to a variety of future employment options and allow the opportunity to network with many professionals. A crew for Corps Members who identify as girls, young women, and/or young transwomen. 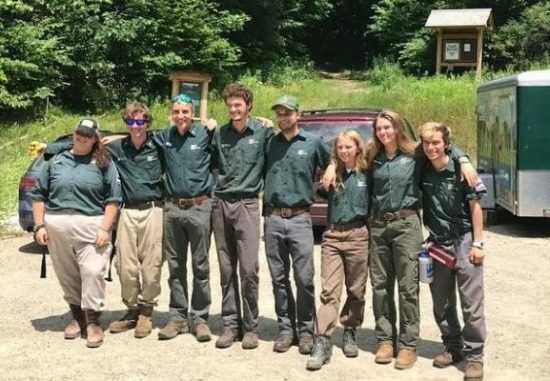 This crew is designed to give Corps Members the chance to explore the conservation field in an environment focused on support, encouragement, and empowerment. Because conservation and other technical trades traditionally have been dominated by cis-men, studies have shown that similar underrepresented identities programs, such as all-women/transwomen programs can be highly effective in building confidence and inspiring them to enter these technical arenas. The members of this crew will be pushed to explore and learn together, and will expand their comfort zones as they build projects and live in a camp setting. Crew Members will benefit from the mentorship of highly-trained leaders, who will add a focus of empowerment, sharing, and support to the crews daily activities. This year we will host 4 regional crews that will camp near their work site. These crews will be staffed by youth from the region! This crews will be focused on everything all different types of projects: land management, trail building and maintenance and water quality work! Able to join a crew for 4 or 8 weeks from mid June to July or July to mid August. If you are unable to find transportation to and from our HeadQuarters in Richmond, please let us know in your interview. Apply now! Apps are reviewed on a rolling basis and due May 15. Email Hans for Conservation or Kyle for Farm related questions.